Thymus vulgaris is often used in cooking. English Thyme is the most popular variety. It has broad dark green leaves and a robust growth habit. Thyme can be used fresh or dried. The fresh or dried leaves and the flowering tops are used in soups, stews, with vegetables, marinades, stuffing, etc. The leaves can also be used in potpourris, and to repel insects such as moths. 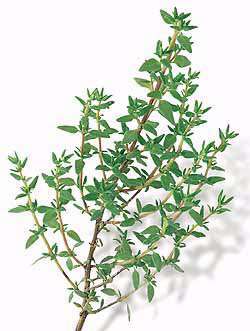 The essential oil of thyme is also added to soaps, toothpastes, cosmetics, perfumes, and antiseptic ointments. Also, it is used in aromatherapy to relieve pain and elevate the mood. Thyme baths have been used to help relieve aches and joint pains. Thyme is rich in an essential oil that is rich in thymol. It is a powerful antiseptic, antibacterial, and a strong antioxidant. Thyme has expectorant and bronchial antispasmodic properties, making it useful in the treatment of acute and chronic bronchitis, whooping cough, and inflammation of the upper respiratory tract. All the members of the mint family, including thyme, possess terpenoids which are recognized for their cancer preventive properties. Rosmarinic and ursolic acids are major terpenoids in thyme that possess anti-cancer properties.A tea can be made by adding one teaspoon of crushed thyme in half cup of boiling water, letting it steep for 10 mins and then straining. The tea can be drunk 3 to 4 times a day for the treatment of coughs. Requires full sun or partial shade. Prefers moist, well-draining soil with a pH of 6.3. It tolerates poor soil and drought. Surface sow or barely cover seed with soil. Keep soil moist but never soggy. For best germination results grow indoors in sterilized soil; black earth/peat moss mixture. Transplant outside after risk of frost.